ND: How did the world of show business came to be the setting of the game? Takata: I considered which elements would be the characteristics of this game after the game systems were decided. I wanted to have many elements about everyday life as I have already created “growing to adulthood in the midst of unusual events” with Devil Survivor. But no everyday life elements came to my mind as I haven’t done them before (laughs). Ando: At the same time we wanted to find a reason why you are fighting together with Chrom. 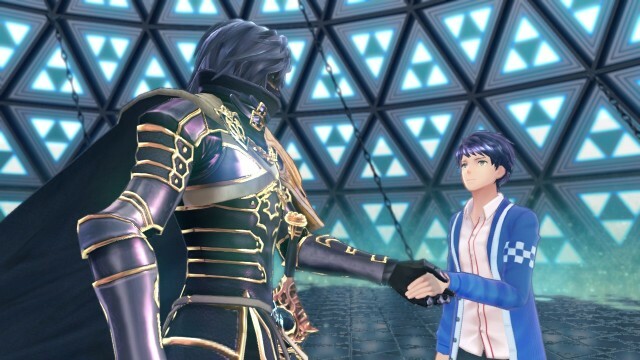 We had discussions as to how you summon Chrom and others like demons in Shin Megami Tensei, but there were arguments about where this power to summon comes from. Takata: In the end we finally arrived at the keyword “performing arts” based on Hirata’s idea. ND: What was Hirata-san’s idea? Hirata: When we discussed what to do with Takata’s everyday life elements, I thought, “I want to do ordinary life so that the sense of crisis and collapsing of the world doesn’t show on the surface. But campus life would be repetition of company’s other titles, so won’t we go with a new keyword?” When I was walking in Shibuya while hearing music and seeing billboards, I got the idea of the world of show business being so near yet so far, but if you keep at it you could shine. ND: You got the idea of world of show business when you were walking in Shibuya!? Hirata: At first staff were also staring me in puzzlement (laughs). I insisted: “Although aura or charisma doesn’t take a physical form, it has some kind of power. Couldn’t we apply that to the game systems?” After that staff also agreed. As for the power to summon that Ando-san was talking about, performing arts was originally born from Noh plays which has supernatural skills, so combining those in the world of our game fits neatly as well. ND: Why are the Fire Emblem characters who appear from “Fire Emblem: Shadow Dragon and the Blade of Light” and “Fire Emblem: Awakening”? Ando: I guess many people think about the first game Shadow Dragon and the Blade of Light when they hear “Fire Emblem”. And then Awakening was the newest entry when we were creating this game, so I think people who have been introduced to Fire Emblem in the recent years probably have a strong attachment to Awakening, so we chose the founder and the newest title. ND: If Tiki is excluded, how were the seven main Mirages decided? Especially characters like Draug and Virion. Hirata: We started by thinking about which classes would be good for gameplay and we decided to include an Archer and a Knight. Speaking from the conclusion, characters were decided based on their compatibility with their partner masters. ND: So did you finish master characters first? Hirata: No, they were done side-by-side. Ando: Things like it’s good to have a heroine that’s a Pegasus Knight were also decided before that. ND: While considering the balance between Shadow Dragon and Awakening characters … ? Hirata: No, we didn’t think much about the balance. Ando: We decided the classes and then discussed which characters among those leave a strong impression. Those were compared to the characteristics of partner masters and interesting pairs were chosen. ND: Master characters have kanji in their name that is related to the class[*]. When names were decided? Hirata: Names were decided in the middle of creating the characters. The writer suggested, “I’d like to put a keyword of the class into a name”, so that was unified. ND: Which [Fire Emblem] title do you like (bonus from the “My Emblem Memory” section of the interview)? Hirata: I do like them all, but my favorite is Fire Emblem Genealogy of the Holy War. I have said this many times (looks at Yamagami-san) but please make a remake! Yamagami: Er, that is complicated!